In many of these scenes the animals and trees call out to us in a way that seems as timeless as the terrain they inhabit. 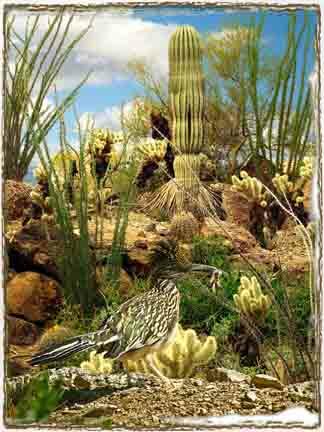 Others speak of the rich and mixed cultural heritage of the Southwest--Native, Hispanic and American. In every case, the scenes are real, very real, and it is the art of digitography that has brought them alive. Be sure and check our other galleries; they overlap a little. For your convenience, we've placed only a few images on each page of this gallery. When you are ready, go to pages 1, 3 in this gallery, or use the tags at the top to view other galleries on our site and place your order. Fueling Up©. Somewhere in this garden, there must be some nectar. Let me see. Maybe here. Our long flowers are just right for feeding probing humming birds, butterflies and moths. And this little guy is also helping the transfer of pollen to ensure the next generation of lovely flowers. Got Lunch?©. Hiss! Watch out. This colorful little gila monster seems to be the guardian of the nearby cactus. But really he is just out of his burrow hunting for a little bit of food and maybe searching for a willing mate. When satisfied, he will go back below ground where he spends most of the year. Just Born©. 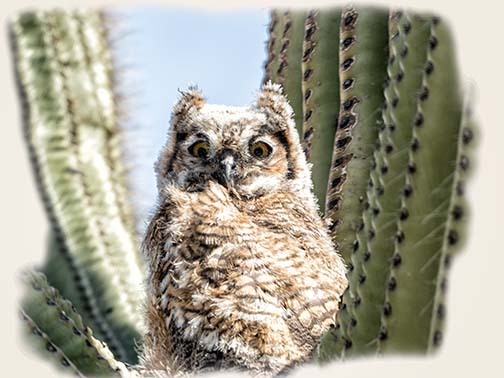 It is difficult to believe that this little ball of fluff will grow into an enormous great horned owl. Just now, she is a few weeks old and she is trying to pretend that she is fierce and not at all worried as you approach her. The only thing moving in the nest is her head. As you walk, somehow her head is always facing you. Long Way Down©. Generally our many small creatures find clever ways to hide themselves, particularly in the daytime. This little guy seems caught by surprise. Perhaps he is young and has not gotten the message yet. Hide! But first, I must get down. Hmm. How do I do that? The Lonely Bull©. The herd went back to the barn. 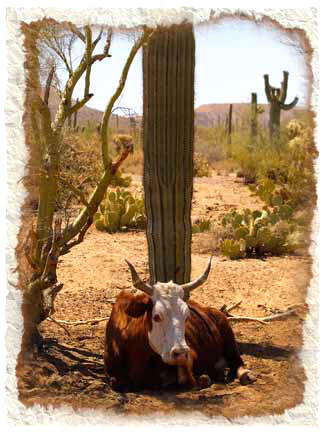 Only the master of the pasture remained to guard the desert from interlopers. He’s friendly, really. But there is little question who is in charge here. Looking Cute©. This little oriole poses next to spring brittle brush flowers. She knows she is lovely and she waits just long enough for us to enjoy her coloring. Then, with barely a sound, she hops to the flowers and continues her search for the tiny bugs that only she can see. Morning Snack©. Road runners have a busy day. If they aren’t in a movie role, they have to fetch their own food. This little guy has managed to find himself a small lizard that just wasn’t fast enough this morning. The road runner’s crest is still up, indicating how pleased he is at his early morning catch. Must Be Love©. 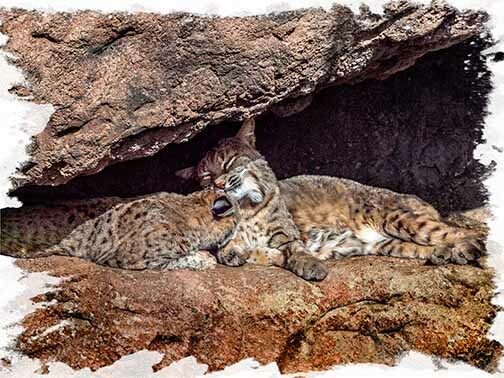 What do two bobcats do when they aren’t out hunting up a little lunch. They could wander around, but why bother? The day is warm and there is no time like now to just relax and enjoy each other’s company. After all—they are cats. 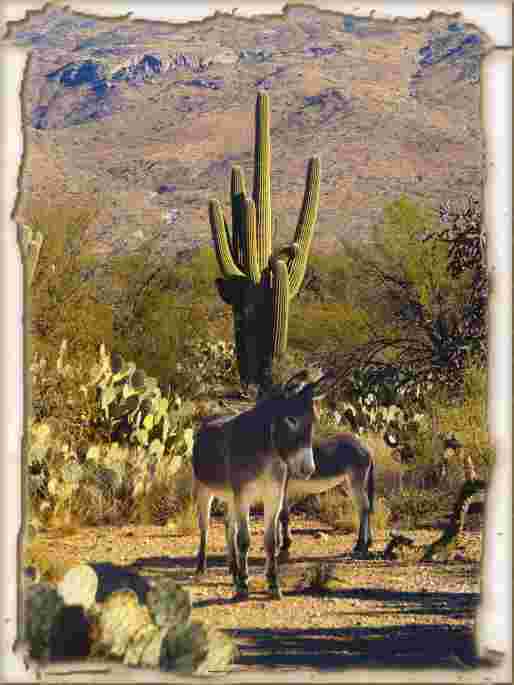 On Patrol© finds two white-nosed burros wandering in the eastern segment of Saguaro National Park. They look as though they are doing fine, scavenging the desert floor searching for a little grass, a little pool of water, and maybe a little petting by some friendly passer-by. One last comment: We know these images are tempting; they are also copyrighted. Downloading for printing or other copying is expressly forbidden.